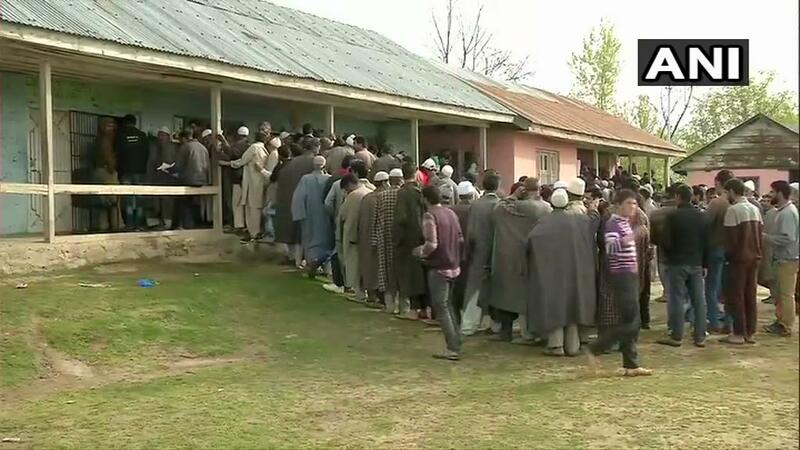 Baramulla (Jammu and Kashmir) [India], Apr 11 (ANI): Voter turn out in Jammu and Kashmir was recorded 11.43 per cent till 9 am during the ongoing first phase of Lok Sabha elections. Speaking to ANI, a voter said: "We are migrants here. It is our duty to cast vote. We want to return to Baramulla." Meanwhile, former Jammu and Kashmir chief minister, Omar Abdullah urged his colleagues on Twitter to encourage people to turn out in large numbers to cast their ballot in favour of Congress candidate Raman Bhalla. "To all my @JKNC_ colleagues & workers in Jammu, Rajouri & Poonch districts please vote & use your vote to send a message against communalism, against fear & against the broken promises of the last 5 years. Vote for Raman Bhalla & send him to the Lok Sabha to fight for Jammu and Kashmir," he tweeted. "To my young colleagues in @JKYNC_ lead by @salmansagar_ & @ajazjan please encourage the youth to come out in large numbers to cast their votes for peace, progress, communal harmony and against the BJP and its proxy parties," Abdullah said in another tweet. support to it by the BJP in June 2018.